Second, hearing as a sensation is itself among the areas that can be trained and improved by the BENAUDIRA – auditory training. The hearing of the individualised training-CD is the way; the improved hearing belongs to the aims. The subjective perception of what a person hears can be disturbed in several ways: One can hear too less, too much or unbalanced. Laden Sie hier den BENAUDIRA Flyer “Tinnitus, Schwerhörigkeit & Hyperakusis” herunter oder fordern Sie hier den Flyer und unsere Therapeutenliste per Post an. Tinnitus is characterised by ringing in the ears or rather ear noises that are mostly perceived subjectively. For the affected persons the tinnitus often means a massive reduction of quality of life. Tinnitus and hardness of hearing can in many cases be alleviated or brought completely to subside. Current studies of several universities prove that. 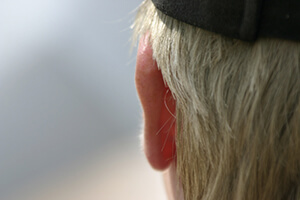 Tinnitus arises from an incorrect connection of neurons in the brain. The ability of the brain to recognise latently present self-produced noises as not needed and accordingly filter them is impaired. Fortunately, however, the brain can be trained up into an old age. The aim of the auditory training is to balance the central auditory processing in a way that the brain is no longer producing the ear noises. The BENAUDIRA auditory training is designed to provide good results for the patients with low financial and time expenditure.Holger Raddatz (Hp) and Manfred Braig (Hp) have performed a pilot study on treatment of tinnitus by individual auditory stimulation in 2004 and 2005. 50% of all participants experienced a considerable amelioration or a lasting freedom of symptoms concerning the tinnitus. Among the participants of the study there were patients hard-hearing and non-hard-hearing. The group of non-hard-hearings experienced even to 75% a relief or freedom of symptoms. Since then, affected people nationwide are helped with the BENAUDIRA BENAUDIRA auditory training. The results are often very good. In some persons, there is despite of a normal or proximately normal auditory threshold a strongly increased sensitivity against loud sound. The central processing of hearing is disordered. Often only some frequencies are perceived oversensitively, others in contrast sub-sensitively. Such oversensitivity against noises can lead to increased blood pressure, nervousness, a faster heart beat (tachycardia) and many further symptoms. An equalisation of the central auditory processing by the BENAUDIRA auditory training can help in many cases to reduce the sensitivity against noises or bring it to subside. Auditory processing and perception disorders show themselves by various symptoms. For example, similar sounding sounds are confused or important information not filtered from the surrounding noises. Common is thereby that the information correctly heard by the ear is processed in a different way in the brain so that the person perceives subjectively another information. The acoustic organ itself is thus not affected. By the training of the brain, the auditory processing can be directed in the right pathways. What is “central auditory processing”? During hearing, the sound takes the way over the outer ear and the outer auditory canal to the eardrum and gets over the middle ear to the inner ear. There it is translated into neuronal impulses that get through the auditory nerve to the brain and are processed there. The way from the auditory nerve to the primary auditory centre is called central auditory processing.. The acoustic stimulus is transmitted over different core regions of the brain into the auditory cortex. It is not until in the central auditory processing of our brain that the signals delivered by hearing are transformed in reasonable information. Even if all involved structures are organically healthy, hearing can be hindered because the central auditory processing is not functioning optimally. It may be that in total sounds are heard too quiet or that single tone pitches are heard in a differently strong way. Then sounds are perceived in another way as they sound in reality. In this way, e.g. meaningful information is only hardly sounded out from background and ambient noises, a speaker out of a group or also the voice of the teacher only insufficiently perceived, or the sense of words not understood if similar sounding sounds like e.g. “n” and “m” cannot be differentiated by the listener. A further precondition for an optimal auditory processing is the collaboration of both brain hemispheres (laterality). If there is an insufficient collaboration of both brain hemispheres, no dominant ear is pronounced, or dominance switches in laterality from one side to the other. The sounds heard are then perceived with delay or not in the right order. The equalisation of the central auditory processing takes place by a training of the brain. In an auditory way the brain gets stimulated in such a way that the perception and processing of the signal (e.g. speech) are improved. Noises and unwanted auditory impressions (e.g. tinnitus) are diminished or fade away entirely.